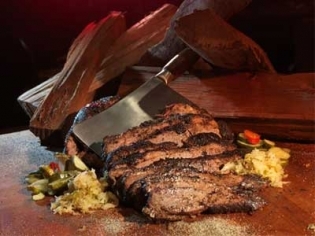 Top notch BBQ in Vegas is what Michael Symon brings you with his new location of Mabel’s BBQ. Vegas is not known for BBQ, but this restaurant just may change that perception. Serving smoked meats with a tasty rub and the choice of 3 different sauces on the side, you may have a hard time deciding which you like best! The brisket is the mainstay for diehard fans of BBQ, but the ribs and pork are not to be missed. All meats are served by the half pound with sides of pickles, kraut and white bread. You can also choose sandwiches, the favorite is the brisket burrito, or big salads that you can top with your favorite protein. Pig Parts like tails, ears and cracklin’ make for some great snackin’! There are many sides to choose from but go for the spiced mac and cheese if you can’t make up your mind. With a huge beer list and some inventive cocktails, this restaurant will have you coming back for more.